What can be better than a cup of coffee? Only one more cup of coffee. So if you consider this way and look something special for your household then make a notice on the Ninja appliances. Each device of the Ninja of production is a highly functional, convenient appliance that fits small kitchens as well as large restaurant rooms. In our post, we will observe one of the most popular devices of this manufacturer ― Ninja Coffee Bar system. It is the unique brewer that can produce the full range of different coffee beverages. 1 Coffee Bar System by Ninja. Coffee Bar System by Ninja. 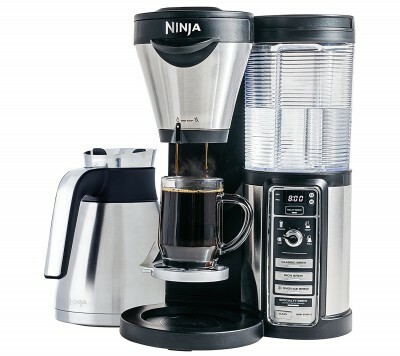 At first, let’s mention that Ninja Coffee Bar is both single serve and drip (or glass carafe) coffee brewing system. It can brew a very wide range of different coffee beverages. But the most interesting fact is another. 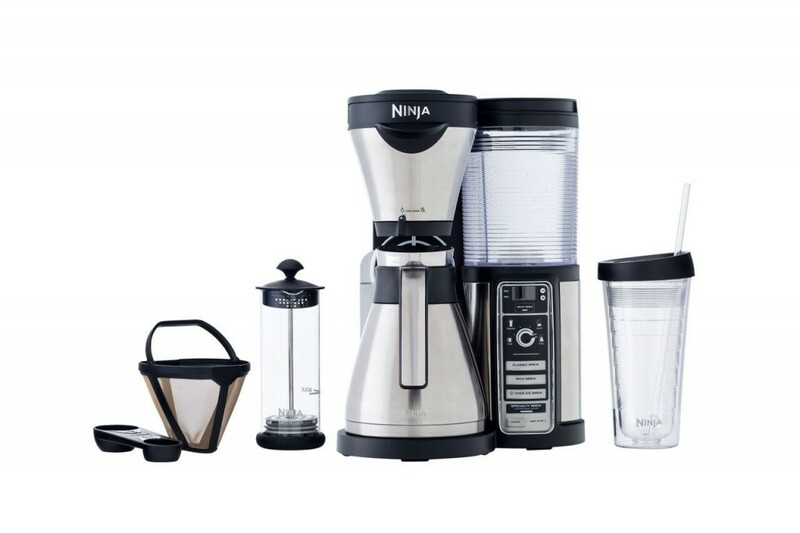 With Ninja Coffee Bar System you are not tied to the coffee brand. The appliance has a pod-free system of single-serve brewing, so, you can mix and combine a drink according to your special tastes. Now, let’s mention some unique features of the device. coffee type (from regular coffee to special iced coffee drinks). Of course, you can switch between the settings manually, or turn on the automatic regime. Also you can set the timer and get your perfect cup of coffee by the time you want it. Ninja Coffee Bar has a multi-size cup platform constructed to fit any cup size. So, you can easily switch between the mugs when, for example, you need to brew different types of the beverage. To fit the smaller sizes you need only to push the platform down and turn the slider on the control panel to the right size. 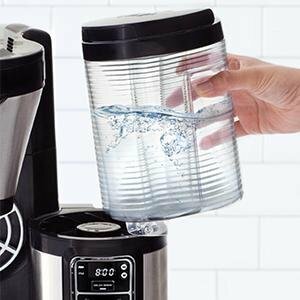 Your machine will automatically get the size and will give the right amount of water for the brew. richness amount and coffee type. It is middle intense coffee with traditional soft taste. Classic brewed coffee is perfect to start your day; you can also sip it during the day and enjoy the perfect flavor of the beverage. Rich brewed coffee has the higher intensity than the classic one. But its taste, not a bitter as when you drink the very concentrated beverage. Hot coffee brewing over the ice save its aroma and its taste becomes more intense and richer. Iced Brewed beverage is very strong and refreshing that’s why it is very popular in the summer time. Special brewing allows you to get high-concentrated coffee basis (like espresso) to produce different milk beverages after. Lattes, cappuccinos, and other coffeehouse style drinks can be brewed with this method. You know, that while purchasing any coffee brewing system make notice on the water reservoir. It’s not only its size is important. The mobility is also important, even more, important than any other feature. We have an example where water reservoir in the coffee machine is built-in (watch the Cuisinart Coffee maker), so you can hardly to fill it properly or wash without a risk to pour the water into the mechanism. 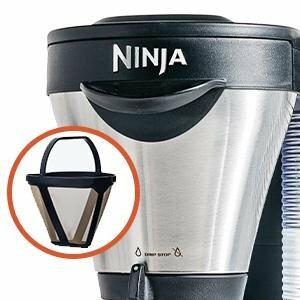 Ninja Coffee Bar has no such problems because its water tank is removable. It is really a great thing if you want to open new flavors and tastes in your kitchen. Milk frother will help to make delicious creamy foam for different coffeehouse-style drinks: lattes, cappuccinos and so on. Frother works both cold and warm milk. The filter basket is used to the better regular coffee brewing. It is commonly used in drip coffee brewing systems (more about different types of coffee machines). Such a basket helps to provide the perfect taste of the beverage both into the carafe and cup. The basket can be easily removed to provide better cleaning of the system. Ninja Coffee Bar System filter works with coffee beans of different ground. So, you can be sure that your coffee will be brewed perfectly. Ninja Coffee Bar System has the 24-hour timer. 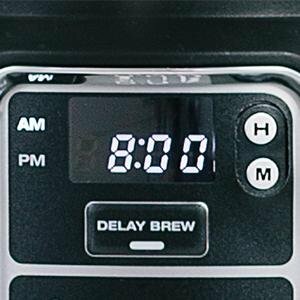 So, you can delay the brewing until the time you want to have your coffee. It means that every morning you will have a cup of perfectly brewed beverage. The only thing that is unpleasant here is that timer will be discarded if there are problems with electricity. Ninja Coffee Bar System has a lot of patented functions that were mentioned in the post but wasn’t called by their names. It was done not to confuse the reader while reading. The system is perfect for those who wants all at once or for the family of coffee lovers. But if you live alone and can do without some features, it’s better to look for something more simple, and cheaper as well.